Home › football › GWA Football: 2009 State Champs! GWA Football: 2009 State Champs! 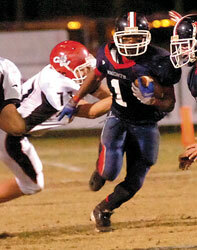 The George Walton Academy Bulldogs are GISA state football champions for the 2009 season! They defeated Deerfield-Windsor School in Albany, GA in the class AAA championship game yesterday, with a final score of 42-24. I am so proud of all the parents, grandparents, students, alumni, faculty, and friends who made the trip down to Albany, some of whom (like us) left Thanksgiving vacation early to be there. It felt like a home game: the fans were loud, the cowbells were clanging, the band played, the Dark Army ran up and down by the field, and the cheerleaders nearly fell over from doing high-kicks for every point scored. Hats off to Deerfield-Windsor for playing tough to the very end, and never giving up. Congratulations to both teams for making it to the championship. Next year George Walton Academy will move to the GHSA, and will be returning most of their current team, so we look forward to more exciting football next season.